Hitting this scene is a sure sign of intelligence! Mixers & Elixirs is back and it’s my pleasure to announce the return of one of the most well-attended events in Houston. 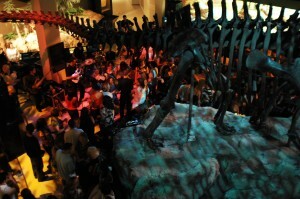 Every Friday night from June through August an average of eleven-hundred people come to HMNS to start the weekend off right! That’s right, the summer’s biggest parties happen at the largest educational institution in Houston. Why? 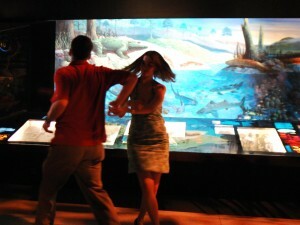 HMNS wants to invite you to experience the Museum in a relaxed atmosphere. Let loose by taking your sweetie for a spin or meeting someone special under the dinosaurs. Try wandering our world- class Gem & Mineral Hall with a drink in your hand and good music in your ear…Check out our 2009 lineup for bands that’ sure to please every musical taste. So how do you get into this awesome party where you can have a cool drink, listen to awesome music, check out the dinosaurs, and meet someone who’s as interested in the exhibits as they are in the party? Click here! Your ticket into the biggest party in Houston goes for just $15 or you can purchase a membership and get in all summer long for only $13. See you Friday, June 5! Next Post Hey Shutterbugs - Freeze Frame's for you!